I have already posted about the benefits of using slow feeding nets to manage hay consumption with horses that are overweight, confined to a stall or that may just need to have something to forage on all day and all night if hay distribution is limited throughout the day. For my previous post and a great article on the documented benefits of using slow feeders, click here. Lately I have been experimenting with ground level hay nets, ones that can contain a whole square bale and be left on the ground to allow horses to eat in a more natural position, that is, with their heads down. Having moved to a new location, the owners and I were concerned about managing hay consumption throughout the day and ensuring that the horses would not run out if we were not able to feed several times a day. 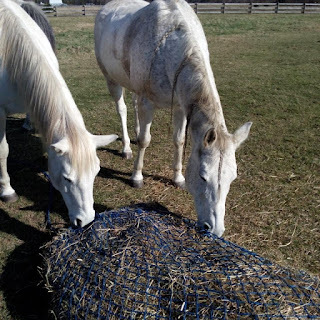 We both wanted to avoid having to rake and dispose of a lot of wasted hay that the horses would no longer eat once it had been trampled or soiled. The other concern was preservation of the pasture. It is not uncommon to see whole sections of pasture footing destroyed by feeding daily in the same spots or area, unless you have enough space to move the horses and allow sections of the fields to rest and recover over time. On small properties, this is not an option. This great hay net has a large opening and large enough holes (1,5 inches), which is important since our horses really do not need to be slimmed down at this point. This size or even a 2 inch opening allows them to eat quite easily but prevents most of the wastage that we currently see when hay is just thrown on the ground or placed in a bin. We have all seen how horses will simply pull the hay out of the bin or trough and spread it around to eat! This net opens wide and is easy to roll over a bale. Once it is filled, the draw string quickly closes the opening and with an ingenious little fastener, will stay closed without having to tie a knot. Since it is not looped, the tail end can be left to drag on the ground or tucked back into the net. So far the horses have adapted very well to it and I find it very convenient. It can also be moved daily so that we are not always feeding in the same place. Slow feeding nets or bags provide your horse with the best feeding method while minimizing wastage. Horses and other equines are grazes who need to eat constantly day and night for optimal health and digestion. Their bodies are not made to be starved for several hours a day, and their small stomachs are not made to handle large quantities of feed all at once. The use of a slow feeder ensures that the horses have free choice access to forage throughout the day and mimic the grazing pattern. Veterinarians, equine nutritionists and scientific studies recommend this type of feeding system. Warning: Hay nets should not be used on the ground if your horses are shod. They are however very safe for barefoot horses. If your horses wear shoes, the nets should be hung to prevent catching the net on a shoe.